Valentine's Day is fast approaching and as a wee treat I have a deluxe box of chocolates from Hotel Chocolat, that bastion of British chocolate. It's the Valentine's Sleekster and there is plenty to share with your loved one this smooch season with three of each flavour and a great variety as usual. So which chocolates are in the box? Buttered Rum - Slug of dark Jamaican rum, buttery caramel, 70% dark. this one packs quite a punch and will definitely warm you up. Illegal Gianduja - I'm not sure what the illegal part is put it's packed with hazelnuts, a bit like that well known spread but a bit more sophisticated. Salted Caramel Kiss - Edgy Guerande sea salt meets elegant caramel. Oh yes please! You Make My Heart Zing - Lemon zing settles down with high-cocoa white. Zesty, creamy, laid-back. On of my favourites, I'd have trouble sharing this one, just as well there is three. Relight my Fire - Hazelnut praline and Habanero chili. It's supposed to tingle your tongue, but I'm a chilli wuss, so not my favourite. Raspberry Iced Tea - Tangy raspberry meet tannic Darjeeling. This was a really good combination, but then again Hotel Chocolat love to surprise us with new flavour combos. Bee Mine - Hit of honey, zing of Prosecco, kiss of gin - wrapped up in 40% milk. Mmmmmm! This one was good! Passion Fruit Cream - High cocoa content white chocolate filled with passion fruit cream. It is glorious! My favourite and no way am I sharing this one. A whole box of these, oh yes please! Salted Espresso Heart - A punchy pairing of deep roasted coffee and cocoa, salted for a savoury edge, with a shot of ground Turkish coffee for nibbly texture. The box is finished with one I really don't like, but then I can't stand coffee, so it's not surprising. I know this would be a favourite for other people so I am happy to share. 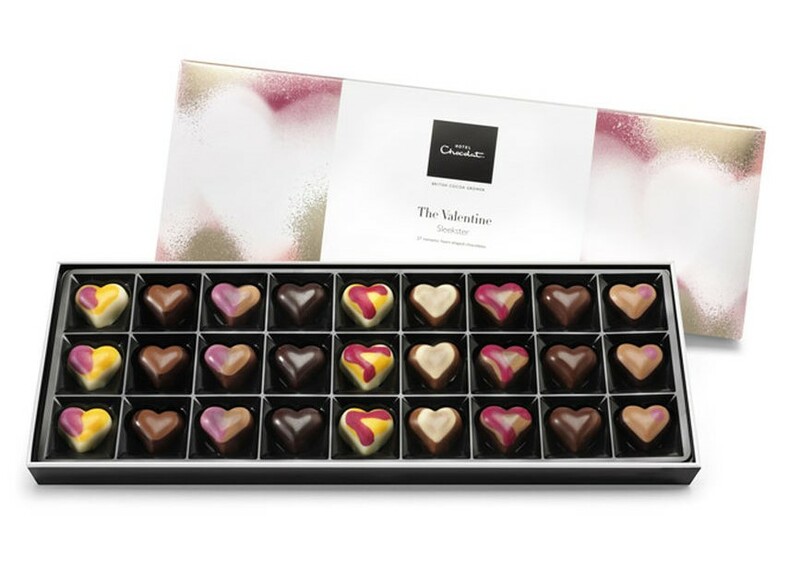 Want to win this fabulous box of chocolates? To enter just leave me a comment telling me which chocolate you think would be your favourite, then enter via the rafflecopter box where you will find more options. This giveaway is open to readers who are over 18 and living in the UK. This giveaway closes on the 9 February 2017. I think my fav would definitely be the Passion Fruit Cream... sounds divine! It's gonna have to be Salted Caramel Kiss! Delicious! Salted caramel kiss sounds gorgeous, and probably the only kiss I'll receive! Anything Salted Caramel or with Chilli gets my vote! I'd go for the Salted Caramel Kiss first! Passion fruit cream sounds delicious! I think the passion fruit cream, sounds delicious! The Raspberry Iced Tea sounds lush! Raspberry Iced Tea for me! The salted caramel kiss sounds like my idea of heaven! Bee Mine. It's got gin in it so that would make me very happy! Buttered Rum ... oh my! I love the description of Passion Fruit Cream but they all look gorgeous to me. i think id love Salted Caramel Kiss! raspberry iced tea sounds yummy!! You make my heart zing, sounds so delicious. You make my heart zing would be my favourite. Pashion fruit cream sounds delicious! Bee Mine wraps up some of my most favourite things! Prosecco & Gin in chocolate... heaven! Bee Mine would definitely be mine 😍 Love prosecco, love chocolate. It's a no brainier! Salted Caramel Kiss would definitely be my favourite! You make my heart zing! Salted Espresso Heart sounds delicious and unique. oooh Relight my Fire!! I love hazelnut and chilli chocolate! The Salted Espresso heart. I love anything with coffee! I love the sound of the 'Raspberry Iced Tea'. It sounds incredibly gorgeous! Passion Fruit Cream without a doubt! Buttered rum sounds amazing. I love hotel chocolat! I think mine would be the Raspberry Iced Tea! I think the Passion Fruit Cream. They've got a lovely variety of flavours here, though. Passion fruit cream sounds delicious. Definitely think the Illegal Gianduja would be my fave ... Relight my fire would be ... without the chilli !!! Adore Salted Caramel. Great competition thanks for the chance to win. I think the raspberry iced tea sounds amazing! The Salted Caramel Kiss - I love salted caramel. I love coffee, so I imagine Salted Espresso Heart would be my favourite. Salted Espresso heart - I do love my coffee! I love the look of 'You Make My Heart Zing'. I can't resist creamy and lemony flavours and it's so pretty as well! Passion fruit cream sounds Devine! Bee Mine sounds really yummy, plus the name is awesome! Salted caramel kiss - yum! Relight my Fire looks great! Salted caramel kiss sounds absolutely amazing, would definitely be my favourite! I think that the Buttered Rum would be my favourite. Tough choice though! The Salted Caramel Kiss sounds fab. the Illegal Gianduja would be my first nibble! Raspberry ice tea sounds amaaaazing! You make my heart Zing. Would have to be Salted Espresso Heart - two of my favourite things, coffee and chocolate! Passionfruit cream would definitely be my fave!! Relight my fire would be my first choice. Love a bit of heat. Salted Caramel Kiss, sounds right up my street. The You Make My Heart Zing sounds lovely. Thanks for this yummy giveaway. It's gonna have to be Salted Caramel Kiss! Sounds gorgeous! Bee Mine - love honey and prosecco! It just has to be Passion Fruit Cream!